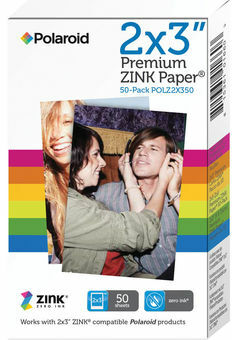 For use with ZINK-compatible cameras and printers, this 50-sheet pack of 2 x 3" Premium ZINK Photo Paper from Polaroid will give new life to your printer and allow you to create vivid prints using Zero Ink printing technology. These are used for borderless photos and feature peel-off adhesive backing for immediately sticking them on a wall or board for display. Also, they are smudge, tear, and water resistant and dry instantly for handling right away.